Having great hardware is all well and good but you need great games as well. You only need to look at the Gamecube (stunning hardware spoiled by having a few great games) to see what I mean. At launch of a new platform there is always a wide mixture of good and bad games, usually down to time pressures and lack of familiarity with the new platform. That being said the PSP has a couple of cracking games out from day one with some more to follow soon. Ridge Racers was the first game I saw on an import PS1. I was stunned by the graphics but the gameplay felt a bit shallow. Since that day I marked down the Ridge Racer series as tech demo’s for the console it appeared on. Therefore I picked up Ridge Racers knowing it would show off the PSP however I found it had more depth than I had expected, especially for a hand-held. Once past the loading screens and into the game proper there are some impressive demo graphics that show off the power of the PSP. Selecting the first level and knowing these were the slowest cars I could not believe how quickly the game moved. No pop-up, no texture tearing and no slowdown. Wow. The handling was also very nice – it had more feeling than I remember and meant I could place the slides wherever I wanted on the track. The music and sound effects were good but you cannot hear them properly unless through headphones. Then the music and effects come alive – there’s some great use of sound in the game that is missed when using the in-built speakers. However it’s the amount of tracks and racing that surprised me. Most tracks from all the last few Ridge Racer games are available in the PSP version just waiting to be unlocked. 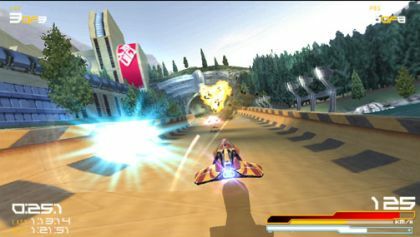 The first few races in the Basic level were easy to get through. Now that I’m onto the Pro levels the challenge is increasing which is good. There are also time trialling options and multiplayer through wi-fi. The multiplayer was easy to set-up too which is a relief as all previous handhelds have used cables and I had doubts about the wi-fi being intuitive. I’m surprised how much I’m enjoying the game – much more than expected. A definite must buy for the PSP. Like the import PS1 and Ridge Racer, Wipeout was the first game that I bought when I bought the UK PS1. This was a truly next gen game. Great visuals, stunning soundtrack featuring Chemical Brothers and Leftfield and a style of it’s own thanks to The Designers Republic. I loved the game too. It was hard to pilot the craft but when you got it right it felt amazing. The tracks were something that hadn’t really been seen before either (maybe Stunt Car Racer was it’s closest relative). Since then the original Wipeout game has been diluted through a variety of poor sequels – could Wipeout Pure be a return to form? Oh yes. 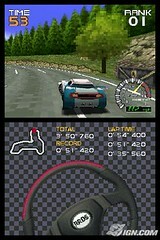 This looks even better than Ridge Racers. There’s a rendered intro that sets the scene then its into some stylish menus and before you know it – first race. At first the pace seems pedestrian but it soon picks up as you move through the faster craft. The graphics are very detailed with lots of trackside scenery. There’s also lots happening on screen. Missiles and bombs, turbo’s, neon lit tunnels, jumps into space all coupled with that feeling of weight when you try and turn your craft. Like Ridge Racers this has more depth than I expected. There’s lots of leagues and time-trialling and a good selection of courses. Like Ridge Racers the multiplayer works smoothly but you cannot have AI controlled craft in a multiplayer race which is a shame. Another aspect that is captured in the hand-held game is the music. A great variety and some tracks that hark back to the good old days really add to the Wipeout experience. Finally to add even more to the game this is the first PSP title that supports downloadable content. 12 tracks, 4 new ships plus extra game skins and team logo’s will be available for download from within the game itself. 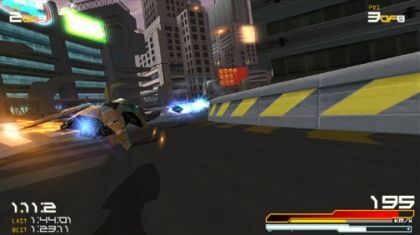 Wipeout comes with a mini-browser which has already been hacked so that you can view web pages on your PSP. The extra game info is saved to memory sticks. Another feature is the ability to visit the Sony website, design your own in-game graphics and download those to the PSP. Superb. Like Ridge Racers a must have game. There are also a few good titles out soon. Mercury is a great looking puzzle game from Archer MacLean, Gran Turismo 4 Mobile is expected in the next couple of months, a hand-held version of Grand Theft Auto is expected alongside Pro Evolution Soccer. 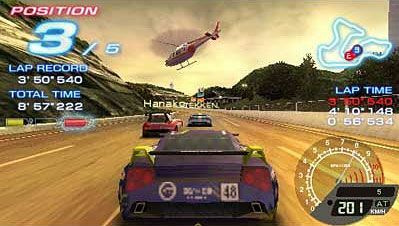 I’ll finish this off by showing a screenshot of the Nintendo DS version of Ridge Racer. Oh dear. While the DS has got a touch screen, it looks underpowered and offers none of the multimedia options that the PSP has. I’m sure there will be some great new games that take advantage of the touch pad but it does not interest me at all – even more so now I have a PSP.